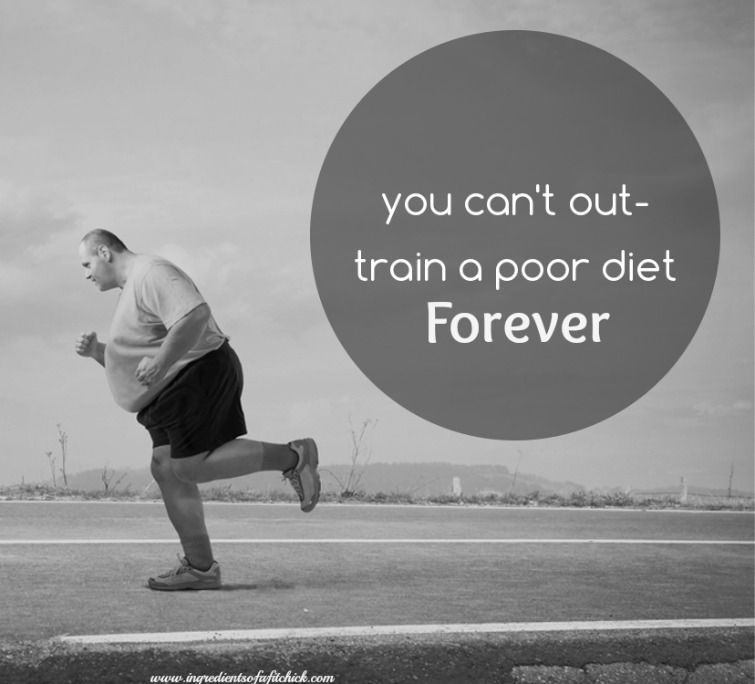 You Can't Out Train Your Diet Forever - Welcome to SarahKesseli.com! As most of you know, I do not believe in the word “cheat” meal. I think every food has a place in any meal plan. However, the meals that most would consider a “cheat” are very high in calories and thus should be eaten in moderation. Many clients tell themselves that they have been ‘good’ all week, so they deserve to treat themselves to a nice meal (or 4) on the weekend. However, many times these treat meals turn into full smorgasbords. They go out to dinner and have several glasses of wine, appetizers, bread/butter, their meal and dessert! Believe it or not, with some people this kind of eating happens more than 1-2x in a weekend. Within just a matter of a few meals, they have eaten back more calories than they burned during the week and have either not lost weight or gained more!!! Many people are so short on time in the morning that they do not make the time for a solid meal to start their day. Your body needs fuel to get through the day. Without a sufficient amount of food when you wake up (most people at this point haven’t eaten in 11-12 hours) you will begin to feel lethargic and will lose focus on your tasks at hand. I always have my clients’ record how their energy levels are throughout the day. This way we can see how often they should be eating. Some people can eat only 3 meals a day, while others need to eat every 3-4 hours. Each of us is different. I usually find that most clients are waiting much too long between meals and thus end up eating too much in one sitting. When you take in too much you begin to feel sleepy and lethargic. This is your metabolism slowing down to conserve energy. We want to keep your metabolism revved so that you can burn as many calories as possible over the course of the day. Some people have a tendency to get so caught up in “This is what and when my plan says to eat” that they do not listen to what their body is telling them. If you are someone who eats every few hours and you are not hungry when one of your meal or snack times rolls around, don’t eat. Wait until you are hungry and enjoy your snack later. On the other hand, if you are hungry before your meal or snack time rolls around, eat! Do not tell yourself, “It’s not time to eat yet. I have to wait another 30 minutes.” When you try to force your body into a plan, it will end up back firing on you. If you are having difficulty in achieving your goals with either your nutrition or fitness, please head HERE to schedule a complimentary consultation with me. Together, we can assess what changes need to be made and get you back on your way to achieving your goals!